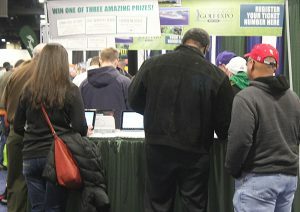 The National Golf Expo is the cure for cabin fever! 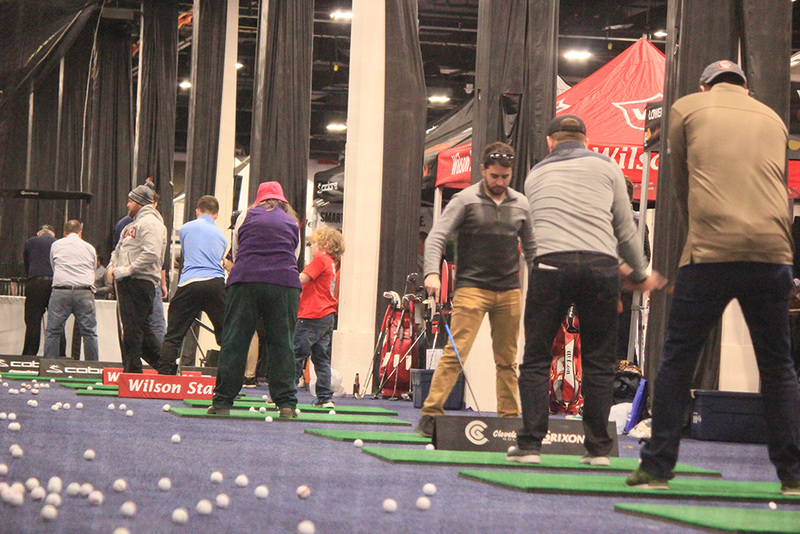 Test the latest clubs from your favorite manufacturers at New England’s largest indoor driving range, get a pre-season tune-up from a PGA pro, try your hand at one or several of our skill contests and get some pointers from our guest speakers at the Seminar & Demonstration Stage! There are events and activities to improve every aspect of your game. Are you ready to bring the friendly competition off the course? 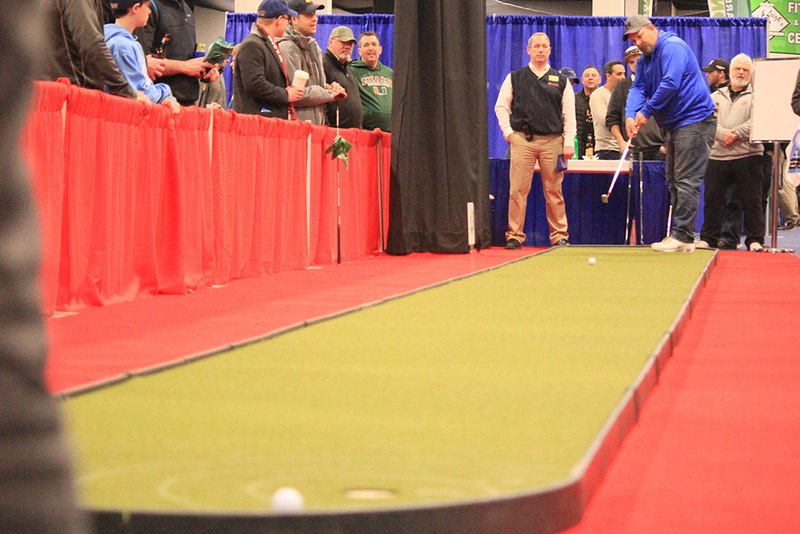 You could win cash and some awesome prizes by participating in the Audi Long Putt Challenge! You’ll have 3 tries to make a 60′ putt. There are 3 categories: Mens, Ladies, & Juniors (under 12). Fee to play is $5 – a portion of the proceeds will benefit the Best Buddies Massachusetts Chapter. Congrats to our 2019 winners! 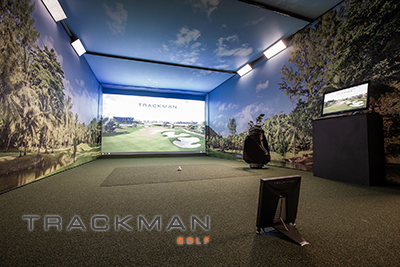 Challenge your friends to a contest of skill, power and form by entering our TrackMan Closest to the Pin Contest. With both a Men’s & Women’s Divisions, play is $5.00 for 3 balls (plus 1 practice shot which does not count in score). Winners will be called or emailed. A portion of the proceeds benefits Best Buddies Massachusetts Chapter. A new feature this year! 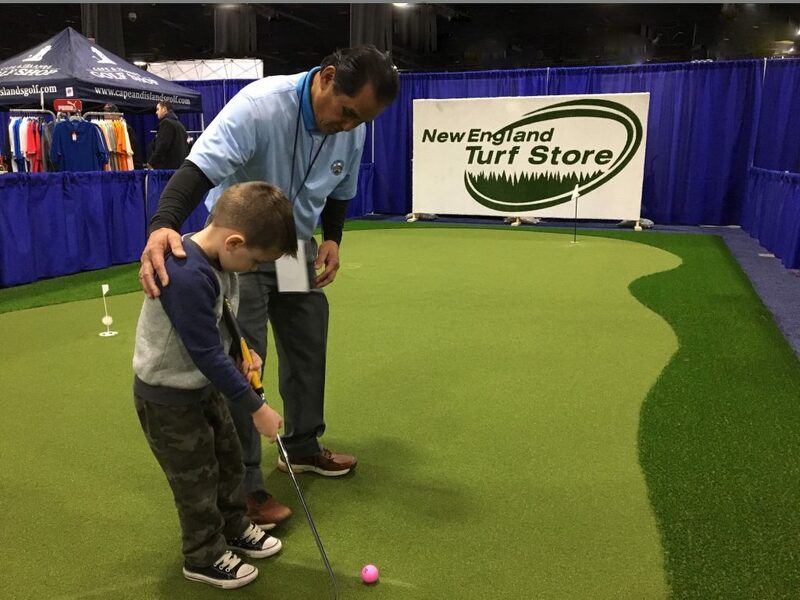 New England Turf Store is setting up a mini-par 3 on which you can test out your short range game. Take three shots at the green. The show’s high score wins a brand new Cleveland RT4 wedge ($150 value). A portion of the proceeds benefits Best Buddies Massachusetts Chapter. Got (short) game? This is your chance to prove it! Grab a club and chip your way to a championship on our air target. $5 fee to play. Great for golfers of all ages! A portion of the proceeds benefits Best Buddies Massachusetts Chapter. Try before you buy! Hit some balls on one of the largest consumer show indoor club testing and fitting ranges available. Check out the latest club technologies from the biggest industry names and get custom-fitted for clubs by Callaway, Cleveland, Cobra, Mizuno, Wilson, Ping, Titleist and TaylorMade. Manufacturer reps will be on hand to demonstrate the latest products. The demonstration stage is the perfect place to pick up that extra tip from the pros to take your game to the next level. Catch a Golf Clinic with Rob “Hardy” Poole, from CBS Radio’s 98.5 the Sports Hub Saturday or Sunday, featuring a panel of his favorite guest pros, instructors and product manufacturers. Work out the kinks in your mental game with golf fitness expert Kaitlyn Sharpless. Check out the full seminar schedule by clicking here, and stay tuned for updates! Open to juniors and adults, the NEPGA Drive, Chip & Putt Contest allows players to hit shots across 3 different skill areas — Driving, Chipping and Putting. Participants will hit two drives on the SkyGolf SkyTrak virtual simulator, 3 chips at various targets and 3 putts on the BirdieBall putting green. Point values are assigned for each shot, and the top 3 finishers each day in the Adult Male, Adult Female and Junior Male & Female divisions will win prizes such as clubs, balls, and memberships to the New England Series and NEPGA Junior Tour. 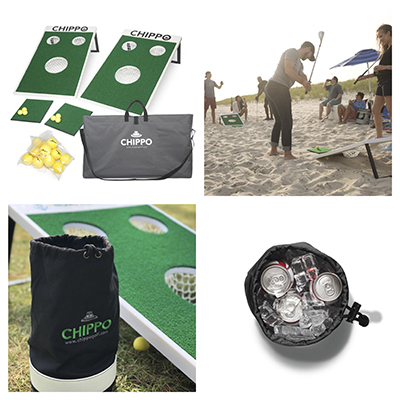 The cost is $5 per person, and all participants will receive a hat and have the chance to win other Drive, Chip & Putt merchandise. All proceeds benefit the New England PGA Foundation. New England PGA professionals will be available for 10 minute tune-ups for $10 per lesson. Participants will be hitting real golf balls into netting over 40′ away, with access to some of the newest iron technology on the market. Instruction will be tailored to each individual regardless of skill level, and all proceeds benefit the NEPGA Foundation. Participants will receive a complimentary hat courtesy of the New England PGA Foundation. 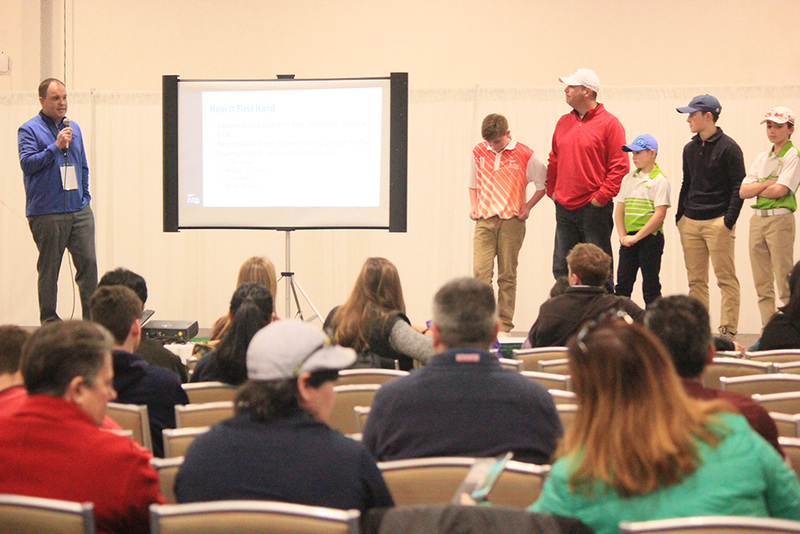 New England PGA professionals will be providing free instruction to junior golfers (age 17 and under). This area wil be open to juniors of all skill levels for a 10 minute tune-up from a PGA professional, and will have access to traditional golf equipment for more skilled players, or equipment such as SNAG and BirdieBall for beginners. All participants will receive a complimentary hat courtesy of the New England PGA Foundation. 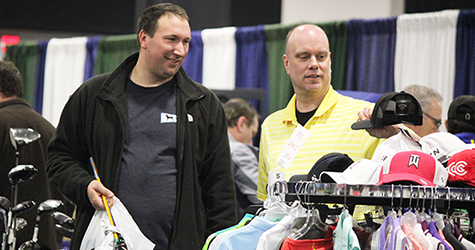 Our participating retailers offer great deals on merchandise and feature innovative new equipment that you may not traditionally find in your local pro shop. Check them out at the show! Take our on-site survey and you could win a trip for 4 to Sunny Hill Resort & Golf Course in the Great Northern Catskills. Enjoy 5 days/4 nights with unlimited golfing at either Sunny Hill Resort or Thurnderhart Golf Course, including all meals and resort activities. Approximate package value: $4,200.